We had Illinois Prairie Electronic upgrade our home services from 100 to 200 amp, then back again to wire a rec room remodel of our basement. They did a great job giving us an estimate, working with us on scheduling and doing the work, and answering all of our questions. They were a pleasure to work and we have already recommended them to friends. Again, I want to thank you and your guys for the job that you did. They were pleasant, professional, and kept the site clean. I would highly recommend your people to my friends." "Response time was very good. It would have been quick enough to satisfy critical medical care requirements if I had any." "It is so easy for me to recommend a company like Illinois Prairie Electric with their high standards of honesty and integrity. 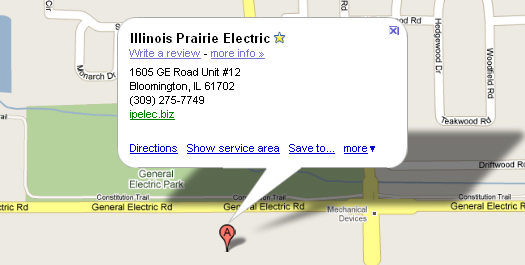 Upon arrival, Illinois Prairie Electric was prompt, thorough, and timely. Their staff was kind and respectful. I felt safe having them in my home amongst my family and pets. After examining the problem, I received a detailed explanation for my dilemma and a clear, itemized bid for the repairs. Thanks to their experience and expertise they protected me from unnecessary work and expenses from other companies. After reviewing work orders and bids from many companies, I knew Illinois Prairie Electric was providing me with an accurate solution to the problem. From now on all my electrical needs will be handled by only Illinois Prairie Electric."